My objective is to create a space that has limited rules, and is an open space to explore and facilitates order among creativity. Provide opportunities for discovery learning and enable freedom to physically roam and make choices while containing a tangible mess for mom. It’s funny how kids actually take well to certain things…. I understand that many houses actually do not have room for a permanent toddler classroom which is another reason I train with The Mess Mat. It is portable! Once we established the rules of the Mat, Cash took to them very well. Now, when we go to visit family for holidays or even while playing outside at the park I can say to him, “This has Mess Mat rules” and he gets it. I can bring along a shower curtain or even a beach towel! This very morning when I went to get Cash out of his room for the day I opened the door to find all of Wyatt’s toys piled on the beach towel. Cash gleefully pointed at his handy work and exclaims, ‘Mess Mat!” Oh, why can’t you understand the word ‘no’ as easily! You win some…. and this system is a WIN! Our new house in Stayton actually lends much better to my system than our smaller house in Creswell. Here I’m actually able to build in a whole Creativity Corner as well to supplement. 1 Shower Curtain (DollarTree) and that’s really it. LOTS of super fun craft supplies! Keep them as simple as possible! No more than 3 MAX. ALL messes STAY on the MAT! 1) The ENTIRE point of The Mess Mat is to stimulate uninhibited, creative, wanderlust of young minds. I believe that they should be able to experiment and express themselves creatively without the fear of doing something “wrong” in the classroom. It is all about discovering what you are capable of. I simply provide the materials and theme and he gets to learn from his experiences. Most importantly, though, I get to learn about him. 2) Some of the manipulatives that I offer just don’t need to be out at the same time or shouldn’t mix. For example, we don’t need Play-Doh and Markers out together, that could ruin BOTH. I also am simply promoting a disciplinary behavior for cleaning up after oneself, committing to being finished and moving on as well as transitioning between two stimuli. I have built all of my Mess Mat Lesson Plans around Cash’s most “attentive” time of the day, which is right when he wakes up, before noon. He is the most engaged, the calmest and listens to instructions the best earlier in the day. Your child probably has this window of brain nirvana too, you just have to find it. With Cash, I get 3 hours MAX and even then he might want to spend it doing something totally not planned. The point is, when you first introduce this open range creative corner of educational bliss, make sure it is when they are in their best mood. When you talk to them about the rules you want them to be their best version of a “good listener” and willing to follow rules. I introduced this method when Cash was about 20 months. We laid everything out and placed an enticing discovery box in the middle of the sheet. I chose markers because he had NEVER been able to use them off the high chair until today. He came out of his bedroom and gleefully ran to this exciting new sheet on the floor, rolled around, swam on his belly and began coloring. I then asked him if he wanted to ‘practice’ making a mess… obviously who wouldn’t. He didn’t believe me at first, but then once I started messing, he joined in and even rolled around on top of his mess. HE was pretty proud of himself too! We made the BIGGEST mess with the colors we could, but when one rolled off the shower curtain I would exaggerate it as if it were a “MAN OVERBOARD” by pointing and exclaiming. Cash wanted to “fix it” and help me, so he would save the marker. We then talk about how things should stay on the mat. It will take you a few days if not weeks to successfully train the rules, but really it is the creativity that counts. We are to the point now where Cash will either ask for The Mess Mat randomly when he opens something new… I brought home new markers from a garage sale and handed them to him at the front door; He started squealing “Maaaaat!” “Messssss!” and dragging me over to it. I can also now leave him there to discover by himself while I go change the baby’s diaper. He can get so entranced in discovery sometimes it is magical. Other times not. Some days he wants NOTHING to do with the Mat and yells “no” right in my face when I suggest it…. It’s a process and just always remember they’re TWO… Set out the materials and watch them learn. Cash always wonders over there at least once a day on his own during the independent time and grabs something. Right now it’s the Play-doh and the tool set! 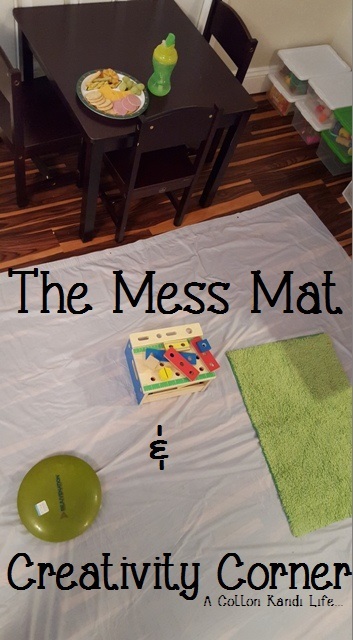 You’ll see that throughout my Toddler School posts I refer to The Mess Mat a lot. I would love to see links in the comments below to YOUR classroom environments and creative spaces! There are so many ways to inspire independent learning! Bring them on! It has really saved us some major clean up! With the Jello and Noodles, I literally just picked it all up by the corners and the mess was all GONE instantly! Clean up for a $1! Can’t beat that!